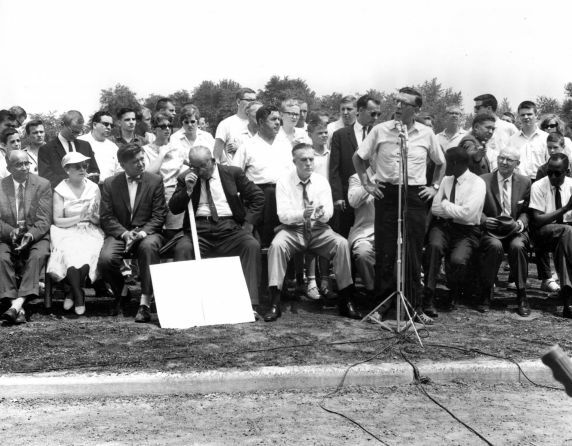 Leonard Woodcock addresses civil rights activists and supporters on the grounds of Grosse Pointe (South) High School during an demonstration against housing discrimination. The demonstration started as a march of 600 NAACP activists and supporters at the intersection of Cadieux and Kercheval in Grosse Pointe. The group grew to an estimated crowd of 2,000 by the time it reached its end at the high school, picking up supporters along its route through business and residential areas. Left of Woodcock is Michigan Governor George Romney, who made a surprise appearance at the rally. To the right of Woodcock, partially obscured by his arm, is Edward Turner, president of the Detroit NAACP.